The 2017 UCGIS Symposium will be held Tuesday May 23 - Thursday May 25, 2017, at the Hyatt Arlington (Virginia). 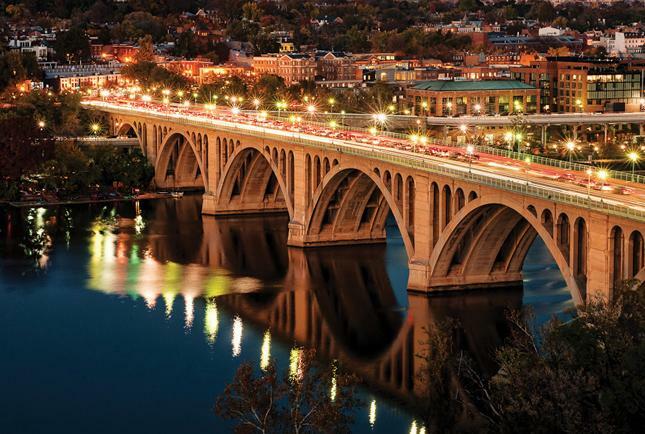 We'll be a hop, skip, and jump across the Key Bridge from Georgetown and the rest of the excitement in Washington, D.C.
Our Symposia are known for their high quality and informative sessions, top-notch information sharing on matters important to the GIScience community, and unparalleled opportunities for professional and social networking within the most active community of GIScience scholars in U.S. higher education. Plus, take advantage of professional development opportunities during our Pre-Symposium workshops that will take place on Monday May 22. Our 2017 theme is CyberGIS and Diverse Partnerships for Geospatial Workforce Development. With this we recognize the wide-ranging community engaged with and working in fields that leverage GIScience expertise. We aim to establish and nurture collaborations centered around cyberGIS, its wide range of domains, and their specialists. For example, some of the topics that connect cyberGIS activities with UCGIS member interest include big data, smart cities, and the food-energy-water nexus. As a special component, this year we are inaugurating a Summer School that will take place the week before the Symposium, hosted by the CyberGIS Center for Advanced Digital and Spatial Studies at the University of Illinois at Urbana-Champaign. The 2017 Symmer School focus is on Collaborative Problem Solving with CyberGIS and Geospatial Data Science, and particular topics will include emergency management, smart and connected communities, and the nexus of food, energy and water systems. Approximately 30 participants - graduate students and early-career faculty - will collaborate in developing novel solutions to scientific problems as they learn about and taking advantage of cutting-edge scientific advances and technical capabilities of cyberGIS (e.g. ROGER) and geospatial data science, and experience the kinds of professional interactions that are key to addressing complex geospatial problems and related big data challenges.